I migrated to Boulder from Atlanta in 1981. We packed our kit and kaboodle, the two girls, found a house and learned the television channels. Boulder is at the foothills of the Rocky Mountains and snow days require consideration. I relied on those familiar faces of the local television personalities to inform me. One day I noticed, as many of you have, that the weather man, the sports caster, and the reporters all look pretty good. They have been companions for thirty years. Front on their faces have remained consistently smooth, clothing in style, and cheerful. How did they manage to keep their looks? I think it is something in the contracts that requires them to do what it takes. Why? This is the culture of the personality in partial defined by how we look. I started to look at hands which are a telltale sign of “wisdom with age” and necks that sag. Even the political pundits that we enjoy manage to masquerade as immortals from the front. My husband was watching one very accomplished national journalist and the camera caught the side angle. This happens quickly and briefly. The camera man probably made a sudden mistake in angle and there is a rapid correction back to the front view. My husband was shocked. He remarked that Mr. National Journalist had a “funny” neck that was in front of his body and his back had a strange hump. He looked “old”. My teacher, Ron Fletcher, enjoyed people watching in the airport. Because Ron was a dancer and a Pilates Master Teacher trained by Joe and Clara Pilates, he looked at the entire package and how the person moved. He would remark that people seemed to have their heads going forward and reluctantly toting behind bad backs, strange gaits and depressed chests. Ron was teaching a workshop in Denver and I coerced a reluctant medical doctor to class. He was amazed. Ron from the back looked like a young man. From the front, Ron was definitely a senior who defied aging. My perception of presentation is similar to Ron’s. When a person enters a room of people and is gifted with a beautiful face we admire them. But the posture is also noted unconsciously and that is also a part of the expectation level. There are strange societal notions that actually perpetuate poor posture. When I coached gymnasts, I had a team of young teens. We talked about presentation which equated finishing a tumbling pass with good form. This included opening the chest and aligning the neck. And I must point out that extreme hyper extension in the lumbar and sacral spine is a deduction. The entire routine depended on proper form and this really begins with the salute to the judge, the walk onto the mat, and striking the opening pose. I would demonstrate a salute with poor posture. We had talked about how judges will be subject to a psychological expectation of a score based on the above. This could be called postural profiling. Upon demonstrating poor posture, the team resounding agreed that the judge was expecting a low performance on a scale of a perfect ten and that a good salute with good posture might influence the judge’s expectation of a higher score. This does not mean that judging is not accurate. It means that every point that the athlete can get might be the difference in placing on the podium. There was much resistance in the group despite this awareness. When questioned, the team would report that if they maintained good posture in school the other kids would see them as “stuck up”. When I see the television personalities, I look with a Pilates eye and think about which exercises I would choose if they came to the studio. I watch films and notice that a certain actor has a “chicken neck” and the “pecking” is part of his delivery. One of my friends is a Pilates teacher, actor, and has his own theater company. He has a unique approach to characters. They have personality, voice delivery, and he directs movement to match the character. Everyone wants to make a good impression. This is where Pilates or any good movement training can make the difference. Good posture and functional movement improve health, build confidence, and extend active lifestyles. 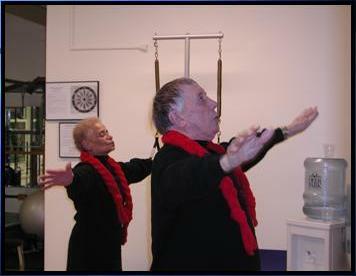 Bruce King, First Generation Master Pilates teacher and friend of Ron had a quote; “Movement in correct alignment produces correct muscular development”. This equates to good posture practiced everyday will develop the muscle balance that allows for good posture to become unconscious. Pilates is a whole package approach. Pilates practice is a good front view, a great side shot, good entrance and fantastic exit.